Hello. I just recently got a mini pig. He is about 7 weeks old right now. I’m just trying to make sure I’m feeding him properly and wanted to know what and how much you were feeding Oscar at this age? Also how much he weighed. I see sweet Oscar and would love for my Tucker to be this sweet but I’m having some trouble getting him to trust us. If you don’t mind emailing me back, I would really appreciate any advice. You seem to be raising a very great little friend and I would love some tips. Thankyou. Hi! Congrats on getting Tucker! When Oscar was 7 weeks old, he was somewhere between 7-10 pounds. At that point, we fed him Mazuri Youth and he got 1/4 cup pellets twice each day (so 1/2 cup total per day). We also fed him some veggies and treats, especially as we were working on the bonding process. There are some useful food charts online, so definitely check those out as well for comparison (I believe AMPA – American Mini Pig Association has one on their website). Thanks for the compliment about Oscar! It’s been a journey! 🙂 In my experience, it’s totally normal that Tucker doesn’t trust you yet, so I wouldn’t worry at all. It took us a few months really before Oscar trusted us and even a few more before he would actively approach us. Some pigs trust a bit more quickly depending on how much they were socialized by the breeder, but ours was a slow process with ups and downs. I felt a lot in the beginning like Oscar didn’t like me and like I was just going through the motions, but we eventually got there. I have a post on Bonding with Your Mini Pig that I definitely recommend checking out if you haven’t, since it talks more about our bonding process with Oscar. 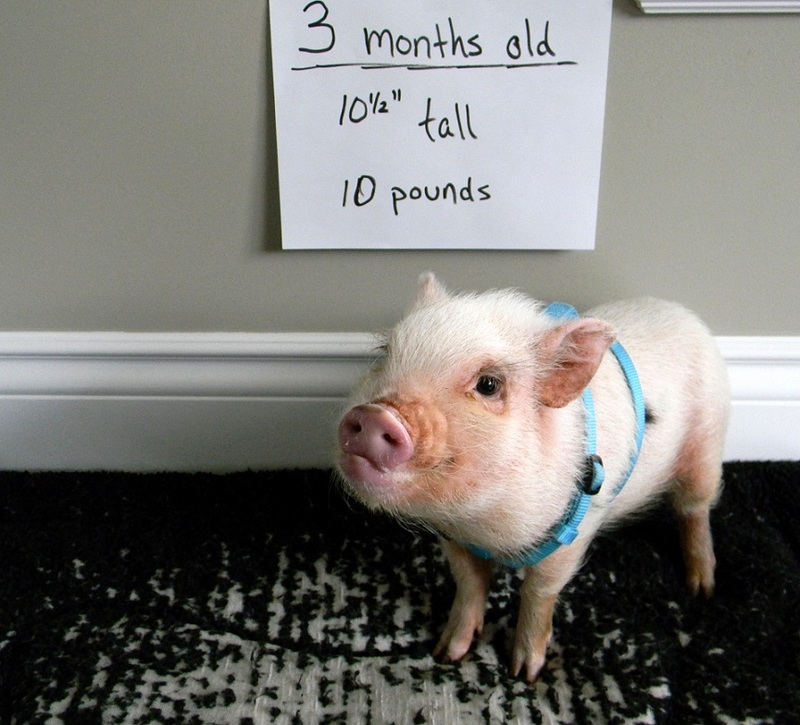 It sounds like you’re a great mini pig parent, so you’ll get there eventually. In the meantime, you might throw in some training (like circle/spin) since that could be a fun activity for you and Tucker that will help build trust as well. Thanks so so much. I am feeding him the same food as you are but I was doing 1/2 twice a day so I’m going to lower that some. Tucker is mostly inside but has a out door pin he can run around in during the day if the weather is nice. I absolutely cannot get a harness on him. He fights me like a bull lol. Is oscars just a dog harness? Do you keep it on him all the time to get use to it. I have to carry him to his outdoor pin (while squealing) lol bc I can’t get a harness on him. Any tips??? One more thing and I’ll leave you alone, since I can’t take him outside to potty bc he won’t let me put the harness on him I’m trying to figure out a way to potty train him to use pee pad or something until I can take him outside. I’m having no success with this either. Any tip would be wonderful. Thanks again for replying. I really really appreciate the advice. No problem! The harness is tough. We do use a dog harness, although none of them are a perfect fit. 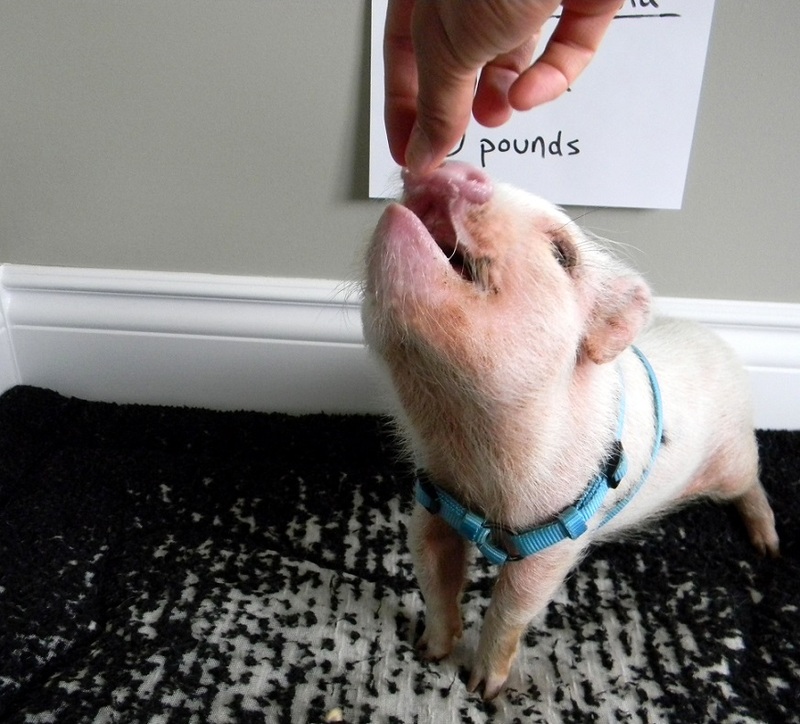 I plan on getting Oscar a mini pig harness at some point, but I wanted to wait until he stopped growing so quickly. That being said, if we weren’t in the country where Oscar is far away from a road with cars, I would definitely get him a mini pig harness because he likes to wiggle out of the dog harnesses. We’ve tried both the step-in and the over-the-head harnesses. When he was a baby, we used the over-the-head ones because he wiggled too much for me to get his hooves in the openings of the step-in kind. Now that he’s older and will stand still, we use the step-in kind more often, but he knows exactly how to slip out of it and does about every other day. My biggest tip on the harness is treats. For us, treats helped turn putting his harness on from a nightmare to a mild annoyance…haha. So, not perfect but better! If you do a search on Life With a Mini Pig for harness, we have a video on putting a harness on that I think you’ll find helpful. Unfortunately, I’m not very helpful on training with a pee pad. Oscar always preferred to go outside to potty, so we never litter trained. We intended to but he didn’t like to go inside. If you prefer him to go outside, I would try some treats to see if Tucker will let you get his harness on and then, if that doesn’t work, try inside. If you can get the harness on him, go ahead and let him wear it around the house while you’re supervising him, and he’ll eventually get used to it. Oscar never minded actually having his harness on after we got it on him, so he just hated putting it on. I do take Oscar’s harness off if I’m not around to watch him so that he doesn’t accidentally hook himself on something. For what it’s worth, the harness does get easier, especially once they trust you and aren’t as wiggly. It’s still a mild annoyance these days but much easier than when he was a baby. Hope that helps! Ok I watched the videos including the one where you are holding him without squealing. I’m going to try that technique as well. Again Thankyou for responding. You have been more helpful then anyone. Where did you get your over the head harness? I’m thinking that will be our best option. We also live in the country but if he slipped out I’m not sure we could catch him lol. Thanks again. Hello! My mini pig, Lachlan, is 8 weeks old and today I took him to the vet. The vet said we was a little big for 8 weeks old. He weighed 9lbs. I thought he was small but I guess not. I know they grow at their own pace but still, I am a little worried. His size doesn’t matter to me but I am a first time owner so I don’t know how other piggies are at this age.